The Reverend John Eddowes Gladstone (JEG) was a cousin of the Prime Minister of Britain, William Ewart Gladstone and, in July 1870, became the third vicar of St. Matthew’s Church in Horseley Fields, Wolverhampton. JEG was born in Bedford Street, Liverpool on August 13th 1814, the third son of James and Elizabeth Gladstone (nee Eddowes). His father, a Liverpool merchant, died when JEG was but 18 years of age and, as a consequence, he was left to the Guardianship of his elder brother, Thomas Murray. The latter thought that JEG ought to join other members of the family in the merchant business and JEG, very much against his will, was duly apprenticed to a business in Liverpool. JEG’s daughter, Laura Edith Gladstone later wrote that her father loathed his work as a business apprentice and longed to serve as a clergyman. JEG’s grandson, Gerald Vaughan Gladstone, also speculated that JEG’s calling to ordained ministry may have reflected ‘his very strong sense of right and wrong, his conscience and his revulsion at a prosperous family business thriving on slaves’. A letter written by JEG to William Ewart Gladstone, from Alderney and dated March 27th 1841,  showed that he was engaged to a Miss Anson. He understood that members of his family, including his uncle (Sir John Gladstone), were ‘decidedly opposed’ to the engagement. He explained that he has ‘warm affection’ toward her and did not want to ‘trifle with her feelings by breaking up the engagement without the strongest reason’. The reasons for the opposition to Miss Anson are not clear; neither is it clear whether the engagement was broken off as a consequence of such opposition. It is clear, however, that Miss Anson did not become a wife to JEG. JEG’s first marriage, on March 16th 1843, was an elopement with his niece’s governess. Prior to his graduation at Oxford, JEG had often stayed at his sister’s house (Elizabeth Davenport)  and there he had met Sarah Lucilla Giles. JEG fell in love with her and she with him. His sister disapproved of the relationship. The couple eloped and were married at Gresford, near Wrexham. JEG was 29 years of age and still a student at Magdalene Hall, Oxford. The marriage of JEG and Sarah produced six children. Sarah died at Norwich in July 1851 whilst JEG was serving as a priest at St. Mark’s Church, New Lakenham. JEG’s second wife was Anna Hoyle, the daughter of Thomas and Lucy Hoyle (nee Ecroyd). Born on December 24th 1813, she hailed from Mayfield Manchester. She attended the Long Acre Episcopal Church (London) where JEG moved to serve after Sarah’s death in 1851. He was strongly advised to propose marriage to her for his four young children were a great anxiety to him and because she had the money to support them. JEG and Anna were duly married at Bowdon Parish Church, Cheshire, on October 28th 1852. The marriage lasted twelve years, with Anna dying on May 19th 1864 near Axbridge in Devon. Their marriage was childless. ‘in 1865, an elderly, whiskery Anglican clergyman of pronounced evangelical views, already twice a widower, with a nearly grown-up family, fell in love with a tall, pretty, amusing girl from North Devon and married her’. A letter to William Ewart Gladstone, dated October 28th 1839, showed that at the age of 25 years, JEG was planning to seek university admission in order that he might train for the ordained priesthood. The Revd David Anderson (curate to the Revd Buddicom, vicar of Everton) was advising him to enter the University of Cambridge for three reasons: firstly, because there was no entry examination at Cambridge and JEG feared that he had 'nearly forgotten all I learnt at school’. David Anderson had also informed him that the majority of mature students went to Cambridge and that, at Oxford, he would be required to ‘live in’ Hall rather expensively. Two months later, JEG had changed his mind about Cambridge. In a further letter to William Ewart Gladstone, he stated that there was no entrance examination at Magdalene Hall, Oxford, and that he would be able to complete his academic studies sooner at Oxford. He now agreed with his cousin that Oxford was indeed ‘the best school for the discipline of the mind of him who desires to be a minister of the Gospel in these perilous times’. In another letter, written in Seaforth and dated January 2nd 1840, JEG thanked William Ewart Gladstone for agreeing to meet him during the month at Hawarden Castle and for writing on his behalf to ‘a friend at Magdalene Hall’. JEG later wrote (on March 26th 1840) to confirm that he had matriculated to Magdalene (Oxford) and that his tutor, Mr. Jacobson, had been very kind to him. He hoped to reside at Oxford with effect from Easter 1840. In yet another letter written from Alderney on 27th March 1841, JEG confirmed to his cousin that he had entered Magdalene Hall as a ‘Gentleman Commoner’ in consequence of his age, and that he was beginning to struggle financially. He explained that ‘the expense of attending that position is very little more than that of Commoners … still it is enough to make it difficult to keep within my limited means’. He further explained that he had sought some private tuition from Mr. Jacobson because he felt ‘unprepared for the lectures at Oxford’. Further private tuition had been agreed with the curate of Alderney (who had graduated from Oxford in 1840). JEG had decided to live temporarily on Alderney because ‘it is a place where I can live cheaply to save some money’. He reassures William Ewart Gladstone that he continues to apply himself to his academic studies: he reads each day from 8am until 1.30pm. He walks until 4pm. He dines with his tutor from 6.30 until 7.30pm and then reads again until 8.30pm. He continued to struggle financially whilst at Oxford and, in a further letter written to William Ewart Gladstone in March 1844, JEG hoped that his brother (James Gladstone) would ‘supply me with the means of paying my way until I get through the university’. He thanked William Ewart Gladstone for his offer of a cash advance, but declined saying ‘I did not think that because I have been born your cousin you are bound because your abilities have raised you to a high station, to find the means of support for me’. However, a letter written later in March 1844 from Oxford revealed that JEG had, in gratitude, agreed to accept some financial support from William Ewart Gladstone. JEG was awarded a BA degree in 1845. JEG’s time at Oxford coincided with the founding of the ‘Oxford Movement’ and he was very clearly made aware of the views of John Henry Newman (1801-1890), Edward Pusey (1800-1882) and Hurrell Froude (1803-1836). As an uncompromising, red-hot Evangelical Protestant, JEG very strongly opposed them and, in particular, their claims that the Roman church was a truer apostolic community than the established Church of England. · Curacy at St. Clements (Norwich): 1845-1846. The Oxford & Cambridge Review (July 1845) confirmed that JEG had been ‘admitted into Holy Orders by ordination of the Lord Bishop of Norwich’. A letter to William Ewart Gladstone, dated September 18th 1845, further confirmed that he had been ordained as curate to the parish of St. Clements (Norwich) where ‘the population are for the most part in a most degraded condition, and where consequently there is much to be done’. His congregation was almost wholly drawn from the local tenements and slums that housed industrial workers. Financial difficulties continued to strain him. By the end of 1846, JEG and his wife had three very young children to support on a curate’s stipend. When he heard news of a vacant living at St. Thomas’, Toxteth, in his in his native Liverpool, he had some grounds for optimism because his uncle (Sir John Gladstone) was the patron. Instead, the vacancy seems to have given rise to tension within the family. ‘If there was a disposition to do anything in my favour, my qualifications are easily ascertainable although, of course, it would not be proper or modest in me to speak of them, and there is no possibility of my preaching in the church; if I could get my duty here supplied during my absence, I could by no means afford to pay the expenses of my journey for that purpose. My views are what are properly termed ‘evangelical’. ‘had I known it was considered essential that each candidate’s opinion should be gathered from his preaching in the church, I should never have troubled you with my application because of the reason before stated … I did fancy there was not a disposition to do anything to favour my appointment’. · Perpetual Curacy at St. Mark’s Church, New Lakenham, Norwich: 1846-1851. The Bishop of Norwich, the Rt. Reverend Edward Stanley, licensed JEG to the Perpetual Curacy of St. Mark’s, New Lakenham, in August 1846. The church had been consecrated a year earlier and stood within the city of Norwich. The 1851 Census showed that JEG remained the incumbent at New Lakenham and that he lived with his wife, Sarah, and their four children at No. 8 Lakenham Terrace in Norwich. The household also contained an unmarried servant cook (Sarah Self, aged 32 years of Wymondham), an unmarried servant nurse (Harriet Parker, aged 16 years of Bedingham) and an unmarried servant errand boy (James Richardson, aged 15 years of Lakenham). · Furrough Cross Free Church at St. Marychurch, near Torquay (1852-1857). In July 1852, the ‘Exeter Flying Post’ reported that JEG had accepted the freehold charge of the new Furrough Cross Free Church at St. Marychurch, near Torquay. St. Marychurch overlooked Babbicombe Bay and was described as ‘a village and parish about a mile and a half from Torquay containing … a population in 1851 of 2293 inhabitants’. The church, described as ‘a modern building built in the Gothic style of architecture’  was without endowment and was supported entirely by voluntary contributions and pew rents. The expense of church building had been borne principally by the late Sir Culling E. Eardley and several gentlemen in the neighbourhood. The church had been provided by them for the use of ‘those of St. Marychurch who, two or three years previously, had discontinued worshipping in the parish church on account of the Ritualistic doctrine and worship that had been introduced there’. The congregation was described as being ‘in connection with no sect or Dissenting denomination; but in every respect except that of not being licensed by the bishop, in conformity and communion with the Church of England’. After five years at the Free Church, JEG’s health gave way and he was ordered to seek hydropathic treatment at Malvern. He moved to live there with his wife, Anna, and his youngest child, Laura Edith. His other children were at boarding school. JEG contacted the local clergy but they were unable to offer him any opportunities in their churches because of his unlicensed status. He was, however, eventually encouraged to take Sunday services in an unconsecrated schoolroom in Malvern. It has been suggested by friends who have been and are interesting themselves for us, that application should be made to Mr. Gladstone’s own relations trusting that on their hearing his present position, they might be induced to come forward at once and assist in fully clearing him from all pecuniary liabilities’. · 1864-1870 Tickenham, near Clevedon, Somerset. Members of the local clergy eventually persuaded the Bishop of Bath & Wells to reissue JEG with a license to officiate within the diocese. In 1864, JEG and Anna moved to Tickenham (a village some 2 miles south of Nailsea in Somerset) where he was appointed as curate-in-charge to the church of St. Quiricus and St. Julietta. Soon after their arrival, in May 1864, Anna died aged 50 years. Euphemia Harris (of Brookfield, Braunton, in Devon) was a member of the congregation at Tickenham. JEG married her on September 28th 1865 and their family grew in size quite rapidly. They soon discovered that the cost of another family was more than a curate’s stipend could bear and, reluctantly JEG approached his cousin, the Prime Minister, to request a Crown living. This was a courageous move because the cousins had differed politically and theologically for more than two decades. Nevertheless, the Prime Minister consented and, in July 1870, JEG succeeded the Reverend Benjamin Wright as the Vicar of St. Matthew’s Church in Wolverhampton. The Gladstone family moved from rural Somerset to industrial Wolverhampton. The contrast was extreme. ‘ I have no real recollection of anything prior to going to Wolverhampton, but the change from the pleasant country to the squalid conditions which existed at St. Matthew’s must have been almost unbearable. This parish was the poorest in the town, no one in its 6-7000 inhabitants being above the standing of small shopkeeper. Ironworks and furnaces were all around our house and the noise of the steam hammers was almost continuous day and night! We quickly became accustomed to and quite ignored these drawbacks, but they weighed heavily on any visitor’. ‘My father was a man of very strong opinions, and it seemed to me rather pugnacious in expressing them. He was, in religious matters narrow and puritanical and fought with all his might the Oxford Movement and the ritualistic changes which it sought to bring about; but he was a deeply pious and Godly man, and in his private life a most kind and courteous one. He made enemies, but was very widely respected and indeed beloved. No one ever had a kinder parent than he was to us’. A letter to William Ewart Gladstone, dated December 1872 and written from the St. Matthew vicarage in Horseley Fields, confirms his firm adherence to evangelical doctrine in the face of emergent arguments by various Biblical scholars and political agitators. In the letter he thanked his cousin, the Prime Minister, for publicly opposing the views expressed by the influential German theologian and philosopher, Dr. David Friedrick Strauss . JEG believed that Strauss’ views were indefensible and dangerous, and that such a clear challenge to Christian faith needed to be fiercely resisted. Parochial schools were of utmost importance to the nineteenth century evangelical clergy, and JEG was no exception. Such schools were regarded as the essential recruiting ground for the young to be won over to the Christian faith. Education was very largely religious in purpose and schools were largely controlled by various religious institutions. In October 1874, JEG offered to sell the St. Matthew’s Church School (in nearby Swan Street) to the newly formed Wolverhampton Board of Education . The Board declined the offer for legal and other reasons, and JEG notified the Board that he intended to close the School. The Board then decided to erect a new school further along the Willenhall Road and to take over the operation of the St. Matthew’s church school as a Board school pending the construction of those on Willenhall Road. In 1874 the school had three teachers and 540 children. There is evidence to indicate that the Gladstone family changed their residential arrangements during the late 1870s. His son recalled that ‘after Edward my youngest brother was born (in 1876), my mother was very ill for a long time and eventually the Bishop gave my father a license to live outside the parish. A house – No. 5 Clifton Terrace, was taken and we all moved there, a very pleasant change as it was situated on the West side of the town instead of the dismal, noisy and slummy east side where St. Matthew’s was’ . Clifton Terrace was located off Clifton Street in Chapel Ash. The Population Census, however, shows that by 1881, JEG, Euphemia and their five children lived in Newhampton Road, Wolverhampton The household also consisted of an unmarried domestic servant named Ellen Mills (aged 25 years of Wheaton Aston, Staffordshire) and an unmarried cook/domestic servant named Ann Hewin (aged 32 years of Wolverhampton). It is probable, although not certain, that the family remained at this address until JEG’s resignation as vicar of St. Matthew. There is no uncertainty at all about the strained nature of the relationship between JEG and his Diocesan Bishop by 1880. A strongly worded 32-page open letter written by JEG to the Rt. Revd. William Dalrymple MacLagan showed the vicar’s determination to defend himself, and the clergy of other parishes, against what he viewed as his Bishop’s injustice and abuse of episcopal authority . The letter showed that the Bishop had appointed an Episcopal Commission to enquire into the conduct of the parish of St. Matthew and its vicar. Although the reasons for doing so remain unclear, there is a suggestion that the Bishop believed that JEG’s ministerial duties were being ‘inadequately performed’. In response, JEG implied that the Commission had been appointed because the Bishop had lost the Right of Patronage  and because he (JEG) and the five new trustees at St. Matthew had opposed a Diocesan plan to reorganise the parish and to incorporate the Monmore Green district within the ecclesiastical parish of All Saints . The church of All Saints had been newly consecrated in 1879. Whatever the true reason, JEG took exception to the Episcopal Commission. He viewed it as ‘a cruel and unkind stretch of episcopal authority’ which affected the rights, independence and well-being of parish clergy. He accused the Bishop of setting in motion ‘a fearful engine of episcopal injustice and tyranny’. ‘In common law, we, the clergy, are your equals, and were I as ready as your Lordship to rush into law, I should at once threaten you with an action for libel and deformation of character, because you have brought against me to the serious injury of my character, as I believe, upon mere tittle-tattle, and not on your knowledge, for I am not aware that you have ever been in my parish, and I am persuaded that personally you know nothing about it, except what you have gathered from my own anwers to your visitation questions, and from the tittle-tattle aforesaid’. I do take upon me to predict, that if your Lordship persists in taking this course of issuing a Commission under this Act, in every case in which any of your presbyters conscientiously decline to do anything you desire at his hands, that as surely as night follows the day, contentment, peace and prosperity will spread their wings to leave your diocese, and seek their abodes in other and more favoured regions. For yourself I will predict incessant turmoil and care – your clergy will not submit to be beaten like boys – but between you and them will rise up perpetual strife – and the mutual confidence and Christian love which ought to subsist between the Bishop and the Presbyters amongst whom he dwells will dissolve and disappear’. The outcome of the Commission’s enquiry into JEG’s ministry in the parish is not known. We do know that JEG remained in office at the church of St. Matthew for a number of years and that the Monmore Green district (and, later, the church of St. Silas) indeed remained closely attached to the parish well into the twentieth century . JEG resigned his benefice at St. Matthew on November 9th 1889 (at the age of 75 years) due to indifferent health. He then lived in retirement with his family in Tettenhall until 1895 . He spent the last six years of his life with Euphemia at their new residence in Braunton, Devon, overlooking Barnstable Bay. It was there, on May 5th 1901, that JEG died of heart failure, aged 87 years. His widow, Euphemia, their five children and her four stepchildren survived him. Euphemia died in 1925. Her remains are believed to have been buried in the cemetery of St. Brannock’s Church, Braunton. There is no known image of the Revd. John Gladstone. Photos of the St. Matthew's church he knew are scarce. This photo of the church, shortly before demolition, is by courtesy of the Wolverhampton City Archives. Glynne Watkin is a non-stipendiary priest at St. Matthew’s Parish Church, Wolverhampton, and is employed at the University of Wolverhampton. He wishes to acknowledge the assistance given to him by Mr. Michael Thompson, JEG’s great-grandson. JEG’s father, James Gladstone was brother to John Gladstone, the Prime Minister’s father. William Ewart Gladstone (1809-1898) first entered Parliament as an MP in 1832. He served as Prime Minister on four occasions – 1868-1874; 1880-1885; February-July 1886; 1892-1894. 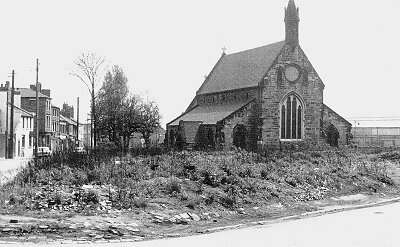 For biographical detail of the priests who have served at St. Matthew’s since its consecration in 1848, see ‘The Parish of St. Matthew’s: the Church and its People, 1848-1998’ by Glynne & Debbie Watkin [Wolverhampton Archives & Local Studies Library]. JEG was one of eight children; Thomas Murray (1807-1877), James (1811-1862), Elizabeth (1809-1880), Helen (1810-1869), Anne (1813-1882), JEG (1814-1901), Susannah (1816-1844) and Mary Catherine (1817-1872). The memoirs of Gerald Vaughan Gladstone (unpublished). GVG was the son of John Ernest Gladstone and grandson of JEG. He was born in October 1901. He entered the Royal Navy in 1915 and saw active service in both World Wars. He retired in 1960 having risen to the rank of Admiral. He died on July 11th 1978. All the personal letters referred to in this article are to be found in the Glynne-Gladstone MSS held at St. Deiniol’s library, Hawarden, Flintshire. Elizabeth Davenport (nee Gladstone), 1809-1880, had two daughters – Mary Helen and Susan. Lucilla Alicia (1844-1921), Francis Edward (1845-1928), James (1846), Cecil Ernest (1847-1909) Laura Edith (1849-?) and Frederick (1850). Lucilla was born in Carlisle, the others at Norwich. Both James and Frederick died in their infancy. The memoirs of Gerald Vaughan Gladstone (unpublished). Florence Bridget (1865-1881), Effie Elizabeth Stavert (1866-1956), John Ernest (1867-1954), William Henry Davenport (1873-1956) and Edward Oliver (1876-1925). Florence was born at Nailsea in Somerst; Effie and John at Wroxall in Somerset. William and Edward were born in Wolverhampton. James Gladstone (1811-1862) of Liverpool. Married Helen Monteath. Theirs was a childless marriage. The Oxford Movement was a religious ‘movement widely influential within the Church of England between 1833 and 1845. It was initiated by a sermon on ‘National Apostasy’ preached in July 1833 by John Keble (1792-1866). He, in common with the movement’s other leaders, rejected the Protestant element in Anglicanism in favour of its pre-Reformation Catholic tradition and denied parliament’s right to supervise the Church. Their views were expressed in a series of ‘Tracts’ that aroused bitter controversy. Robertson Gladstone (1806-1875) was son to Sir John Gladstone and brother to William Ewart Gladstone. Sir Thomas Gladstone (1804-1889) was the eldest son of Sir John Gladstone, and brother to Robertson Gladstone and William Ewart Gladstone. One sermon was entitled ‘Tractarianism is Popery and must be expelled’. It was delivered by JEG at Long Acre on December 7th 1851. It is printed in ‘The Penny Pulpit’ No. 1822, December 1851; pp. 693-701.
 reported in ‘The Christian Journal’, 1852.
 reported in ‘The Gospel Herald’, 1851. It was reported that JEG had been forbidden to exercise his ministry within an Established Church anywhere in the province of Canterbury. Billings Directory and Gazetteer of Devon, 1857.
 the evangelical vicar of St. Matthew’s church , 1855-1870. The recollections of John Ernest Gladstone:1867-1954 (unpublished). See ‘The Parish of St. Matthew’s: its church and people, 1848-1998’ by Glynne & Debbie Watkin [available at Wolverhampton Archives and Local Studies library]. From the unpublished papers of the late George Edge who began to assemble materials on the early history of St. Matthew’s Church, Wolverhampton. Earlier in 1872, Strauss had published ‘The Old Faith and the New’ which presented a sceptical stance in relation to the ‘reality’ of Christ. The Rt. Reverend William Dalrymple MacLagan (1826-1910) served as the Diocesan Bishop of Lichfield from 1878. In 1891 he became the Archbishop of York. S. E. Whitehead (1884), H. L. Clayton (1886-1887) and R. P. Lewellin (1888-1890). The Reverend Sampson Cordon succeeded JEG as the vicar of St. Matthew in 1889.
 set up by the Forster Education Act of 1870. A letter addressed to The right Reverend The Lord Bishop of Lichfield by the Reverend John E. Gladstone, Presbyter and Vicar of St. Matthew’s, Wolverhampton. Published by John Steen & Company, Printers, Queen Square, Wolverhampton, 1880. After 1879, the patrons at St. Matthew are recorded in the Lichfield Diocesan Directories simply as ‘five trustees’. The evangelical clergy of the town warmly welcomed the appointment of trustees. It was seen as a means of ensuring that more people became involved in church appointments and that evangelical clergy could be attracted and appointed to the new churches. This would have been difficult to ensure as long as church patronage remained vested in the Crown and Bishop. In August 1879 an Order in Council presented to HM Queen Victoria (at Osborne House) granted patronage of St. Matthew’s church to Mr. Edward Pugh, The Reverend William Dalton, the Reverend Alexander Baring-Gould, the Reverend Frederick Williams and Dr. William Millington. A brief history of St. Silas’ church (1898-1938) –which served the Monmore Green district - is contained within ‘The Parish of St. Matthew: the church and its people, 1848-1998’ by Glynne & Debbie Watkin [available at Wolverhampton Archives and Local Studies Library].